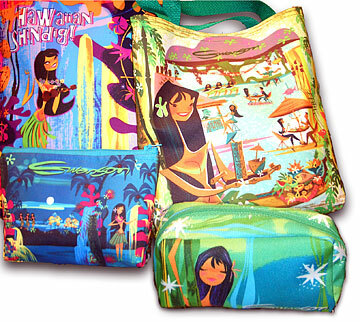 Precious, an Aloha Tower Marketplace boutique specializing in gifts, jewelry and apparel, has added North Shore artist Mark Swanson's brightly colored fabric totes, bags and cosmetic pouches to its mix. Precious is the only store outside of Swanson's North Shore gallery to carry his accessories. The purses, depicting an exotic Polynesian fantasy land as imagined in the 1930s and '40s, are popular with locals and visitors "because of the kitschy, retro feel of his art," said Van Ko, of Precious. The accessories, at $15 to $45, might be the perfect gift to perk up a cold-weather friend's spirits if you're Christmas shopping for someone on the mainland or overseas. Call the boutique at 599-2828.